because every piece of work has interesting stories and emotions behind it. No doubt it can be a great stimulus to start a conversation about today’s technological progress or to reminisce about the bygone days. Are you a tech-savvy person? Then hand-painted motifs of cars and technology will suit your workshop or engineering office perfectly. The artworks will exude inspirations and bring you new ideas incessantly. Or are you perhaps looking for a painting for your kitchen? A painting about invention makes a magnificent backdrop for the place where you experiment with food and create culinary delights. There are no limits as to how and where you present the artworks! At KunstLoft you can find a wide range of different sizes. 31x47 inches is the most popular size for acrylic paintings – the landscape format makes it the perfect decor that fits perfectly between the top of your shelves and the ceiling. Technology does not stop evolving, and equally, how your home looks can be improved or completely redesigned anytime. Take advantage of our varied offer of handmade canvas paintings and sculptures to polish and freshen up your interior design. No one likes boring and antiquated designs! Bridge motifs in a shiny copper tone also coordinate well with the theme of cars and technology. 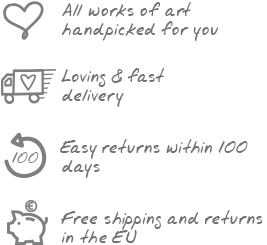 At KunstLoft you may have the pleasure of risk-free shopping, since we offer a 100 day return policy. Order your favourite piece of artwork and feel how it changes the atmosphere of your living room. You will notice how everything complements each other perfectly just like the different components in a well-functioning machine. Technology captured on a hand painted canvas. Impressive buildings, machines and cars are immortalised in the acrylic paintings of KunstLoft artists. Decorate your office with these artworks to motivate yourself to achieve great things and demonstrate your sense of style.